Italian political leaders, in a direct affront to Paris, have enthusiastically endorsed the French Yellow Vests movement, which has been staging anti-government protests since mid-November. The Yellow Vests movement began as a protest against a planned fuel price hike, but went on even after the government backtracked on its intentions, with protesters clamouring for improvement to their financial situation. Protests drew global attention as they turned violent, resulting in several deaths, multiple injuries and significant damage to property. Italian Deputy Prime Minister Matteo Salvini, the leader of Lega party, on Monday threw his support behind the French, who, according to him, are protesting the president whose policies are "against" his own people. Meanwhile, Deputy Prime Minister Luigi Di Maio, the leader of Five Star Movement — the second half of the Italian ruling coalition — wrote an open letter, urging the French protesters not to "weaken" and offering the help of his own party and, in particular, its online platform Rousseau. These expressions of support were met with a sharp rebuke on part of the French government, as Nathalie Loiseau, the French Minister for European Affairs, tweeted that France refrained from giving lessons to Italy and suggested that Salvini and Di Maio should take care of their own country first. Later in the week, Loiseau elaborated on her remarks, stressing that the "interference" was equally disliked by the French government and the French. "I asked for explanations and I was told that Mr Di Maio expressed himself not as a member of the government, but as a member of a political movement… But when you are in the government, you are in the government!" Loiseau said, as quoted by L'Opinion outlet. The French minister added that such interference could hardly help "improve the lives of the Italians" and was just a means of "distracting them from their problems." Mischael Modrikamen, the leader of Belgium's People's Party, pointed out that such personal attacks were rare in the European Union. "This is an incredible political slap… In diplomatic terms, this is heresy that heads of state speak about others in such terms," Modrikamen told Sputnik. However, French President Emmanuel Macron was the one to start the crisis "with his arrogant remarks last year," the Belgian politician believes. In June, Macron accused the Italian government of "cynicism and irresponsibility" amid a migration row. Italy, which had for several years served as the country of first entry to the European Union for numerous migrants, changed course under the new coalition government. Rome refused to let in a boat carrying migrants rescued at the Mediterranean Sea during their attempt to cross over to Europe. Salvini insisted that no ships of non-government organizations with rescued migrants on board would be allowed to dock in Italy. Marco Zanni, a member of Lega and of the European Parliament, has called Macon's attitude "unacceptable." "The Italians are now a large majority to support their government… If we had had to wait for decisions taken or simply proposed by the European Union, nothing would have been achieved yet after more than four years of inaction. Italy is a first-line state who has seen hundreds of thousands of illegals disembarking. The arrogance of Macron is simply unacceptable," Zanni told Sputnik. In August, EU states agreed to continue Operation Sophia mission for the rescue of migrants at sea. However, Italy's call for France and Spain to open their ports for migrants saved at sea did not garner enough support. Gilles Lebreton, a French member of the European Parliament and of the National Rally (RN), believes that the latest French-Italian disagreement shows "how wrong the French government is in its migration policy." "France created the issue by treating the new Italian government as amateurs, but their policies function and they — not Macron — have the support of their fellow citizens. France is very ill and the [European] elections of May will be a test for all. They will redraw the lines, in France and Europe," Lebreton told Sputnik. The Yellow Vests movement is not planning on participating in the European elections, according to one of the movement leaders, Christophe Chalencon. "We are not presenting a list to the European elections. We must first build and consolidate ourselves. I announced that even if the list were to come up, I will not be a candidate," Chalencon told Sputnik. The movement needs to be structured first, promoting citizens' assemblies and national coordination, Chalencon said. "All help is welcome, including from Italy!" he added. Mario Borghezio, a member of the European Parliament and of Lega, argues that if the Yellow Vest movement can build a structure for itself, "it will undoubtedly have the ability to do so without resorting to foreign aid that could be judged as undue or inappropriate interference." Borghezio stressed that Italy does not want "diplomatic incidents with its neighbours but only a fair and equal collaboration," but added that Macron should "reflect on his enormous decline in popularity." 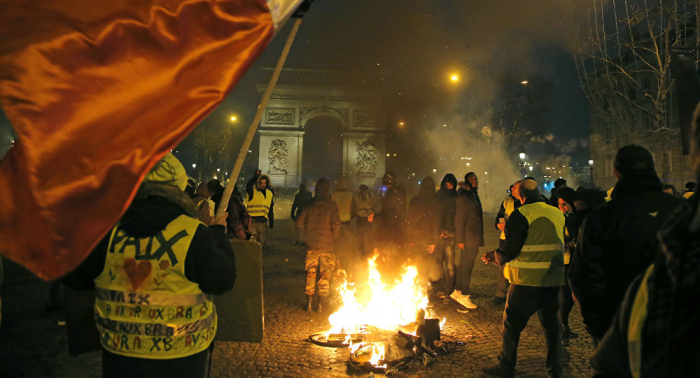 The French president saw his approval rating slump throughout the protests, but an Ifop-Fiducial poll showed a five-point improvement earlier this week, for the first time since the unrest began. The new year will show whether Macron can turn the tide.